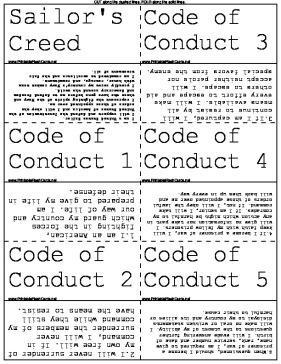 These navy flash cards are perfect for learning the Sailor's Creed, Code of Conduct, and General Orders of a Sentry. Use these flash cards to prepare yourself for a career in the Navy! Sailor's Creed I am a United States Sailor. I will support and defend the Constitution of the United States of America and I will obey the orders of those appointed over me. I represent the fighting spirit of the Navy and those who have gone before me to defend freedom and democracy around the world. I proudly serve my country's Navy combat team with honor, courage, and commitment. I am committed to excellence and the fair treatment of all. Code of Conduct 3 3.If I am captured, I will continue to resist by all means available. I will make every effort to escape and aid others to escape. I will accept neither parole nor special favors from the enemy. Code of Conduct 1 1.I am an American, fighting in the forces which guard my country and our way of life. I am prepared to give my life in their defense. Code of Conduct 4 4.If I become a prisoner of war, I will keep faith with my fellow prisoners. I will give no information nor take part in any action which might be harmful to my comrades. If I am senior, I will take command. If not, I will obey the lawful orders of those appointed over me and will back them up in every way. Code of Conduct 2 2.I will never surrender of my own free will. If in command, I will never surrender the members of my command while they still have the means to resist. Code of Conduct 5 5.When questioned, should I become a prisoner of war, I am required to give name, rank, service number and date of birth. I will evade answering further questions to the utmost of my ability. I will make no oral or written statements disloyal to my country and its allies or harmful to their cause. Code of Conduct 6 6.I will never forget that I am an American, fighting for freedom, responsible for my actions, and dedicated to the principles which made my country free. I will trust in my God and in the United States of America. General Orders of a Sentry 3 3.Report all violations of orders I am instructed to enforce. General Orders of a Sentry 1 1.Take charge of this post and all government property in view. General Orders of a Sentry 4 4.Repeat all calls from any posts more distant from the guardhouse (quarterdeck) than my own. General Orders of a Sentry 2 2.Walk my post in a military manner, keeping always on the alert and observing everything that takes place within sight or hearing. General Orders of a Sentry 5 5.Quit my post only when properly relieved. General Orders of a Sentry 6 6.Receive, obey, and pass on to the sentry that relieves me all orders from the Commanding Officer, Command Duty Officer, Officer of the Day, Officer of the Deck, and Officers and Petty Officers of the Watch only. General Orders of a Sentry 9 9.call the Corporal of the Guard or Officer of the Deck in any case not covered by instructions. General Orders of a Sentry 7 7.Talk to no one except in the line of duty. General Orders of a Sentry 10 10.Salute all officers and all colors and standards not cased. General Orders of a Sentry 8 8.Give the alarm in case of fire or disorder. General Orders of a Sentry 11 11.Be especially watchful at night and during the time for challenging, to challenge all persons on or near my post, and to allow no one to pass without proper authority.